Swimming pool near the Spanish villa in Ibiza to rent. Just relaxing in the garden of your villa, whilst your children enjoy themselves in the swimming pool of your Spanish villa. If you visit ibiza, you want to see more of this unique island. As it has so much to offer! It is long known that a lot of songs are written in Ibiza, before the rest of the world hears about it. no wonder that the a-list celebrities spend the summer in Ibiza. 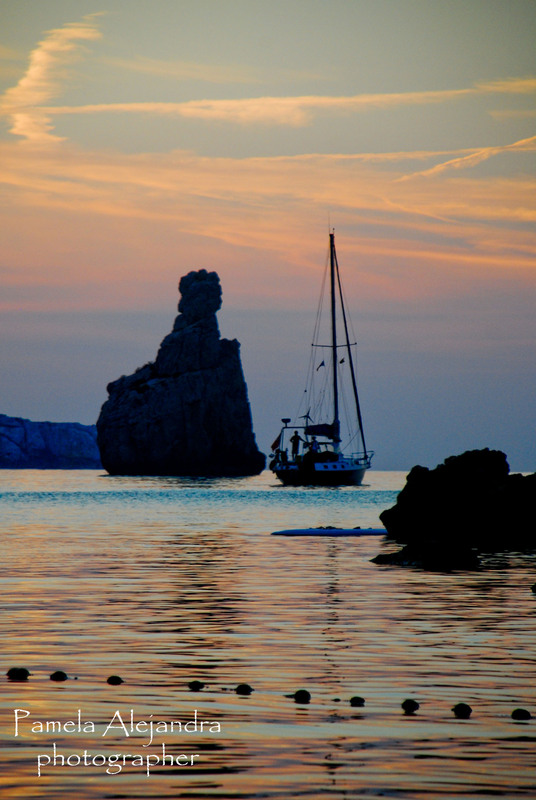 Did you know Ibiza has at least 50 beaches, each of them an impressive piece of wonderful nature? Some of them are visited frequently, but there are plenty which are not overcrowded by tourists. They are all very nearby, accessible within half an hour by car. The island is only 45km (approx 30miles) in longitude. in this Spanish villa you will guaranteed enjoy every minute. Early birds will be able to see the sun rising above sea level. 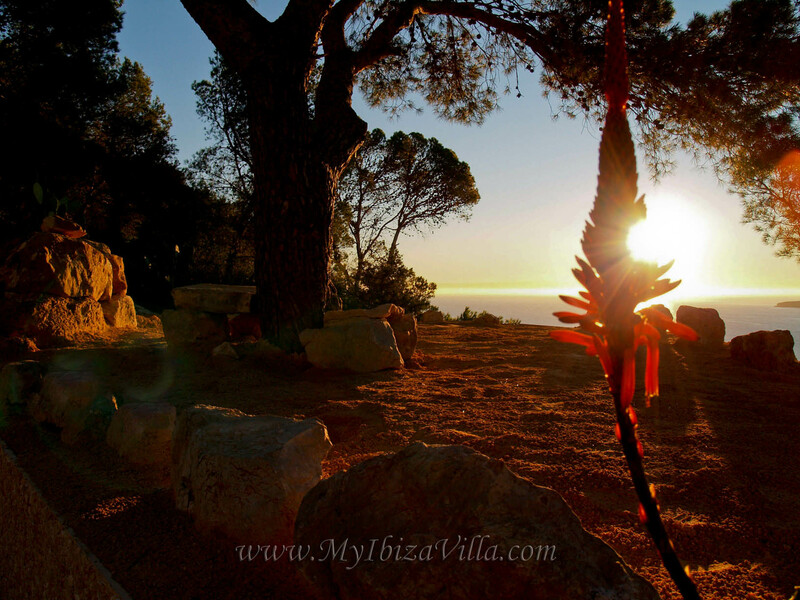 our Ibiza sea sunrises and sunsets. The yoga-terrace of this Spanish villa is in the middle of the rockery garden, it is the ideal place to relax body and soul. It would be the ideal start of a new day, the morning sun on your face and your feet the feel of beach sand. 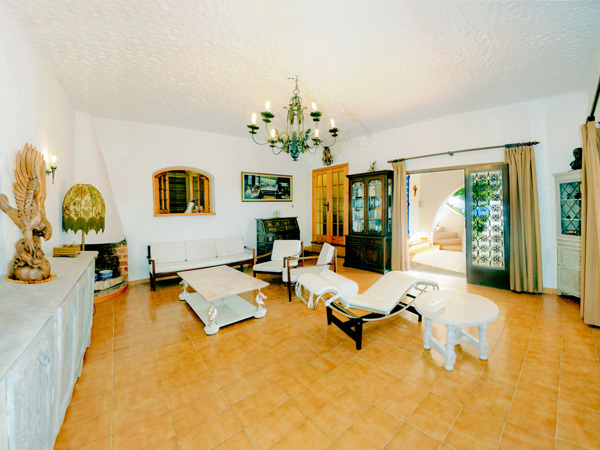 Enjoy with your family full breakfast at the shady upper terrace of this Spanish villa. The view is absolutely breathtaking, with in the distance the island of Tagomago. You will be anticipating the return of the local fishermen, who return with their catch in their fishing boats. Do you need some free time after breakfast? The hammock is waiting for you. the deckchairs and loungers on the yoga-terrace are the right place to discuss the plans for the day. The sunlight is filtered through the old pine. Again a very relaxing area. And to start the day really fit, the massaging jets of this Spanish villa whirl pool will give you a relaxed feeling. Between 2 and 5pm all restaurants are open for lunch. 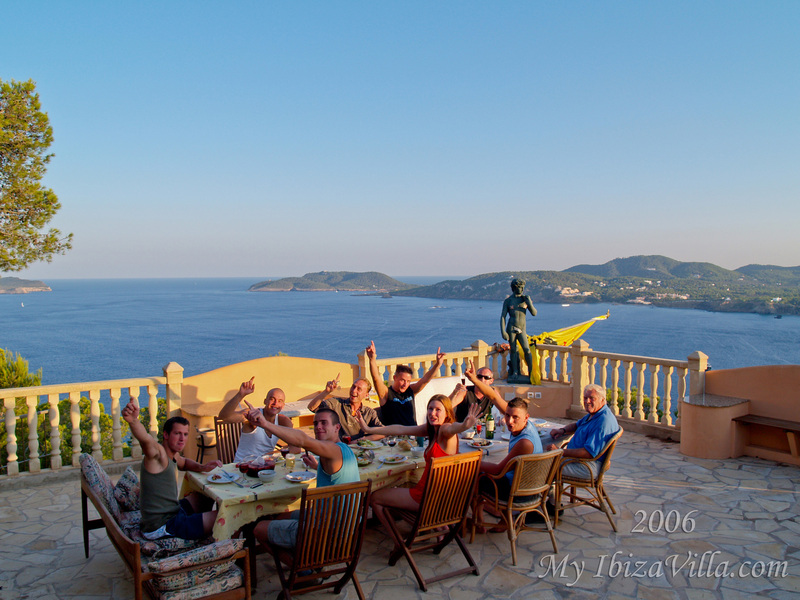 Ibiza has a variety of restaurants offering excellent original food. Most restaurants are right by the sea, which enables the children to enjoy themselves at the beach, whilst you are still having your coffee and liquor. You should try some authentic Ibicenco food like - 'la parrillada de pescado' or 'bullit de peix'! only 15 min drive from the villa, the owner 'el bigote' serves every day from 2.30pm a "bullit de peix" fish stew, made with the fresh fish his son has caught that morning. But you have to make reservations beforehand in person, as they do not have a telephone nor internet. 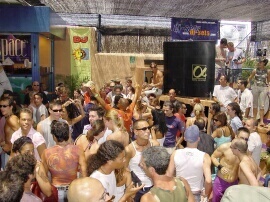 the club 'Sa Trinxa' combines excellent music with healthy meals, in an amazing setting. 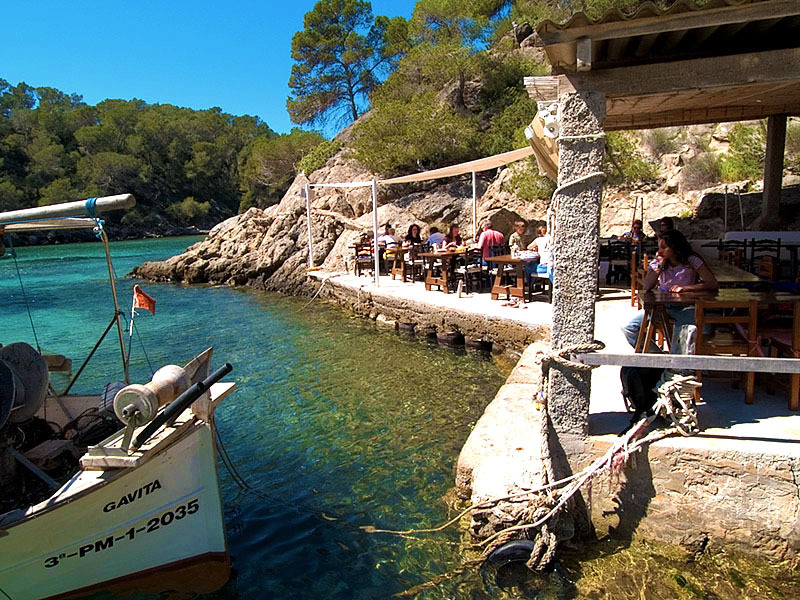 blue marlin in the Cala Jondal bay has to be visited for breakfast, lunch or diner. at the beach relaxing with a mojito or a daiquiri, in the evening dancing to the best music a the party. On Saturday or Monday evening there is, 10 minutes from this Spanish villa, a Hippy market in Las Dalias, a renowned bar, visited once by Bob Marley and John Lennon. In Ibiza there is always something to do. And if this is not enough, you can hire a speedboat and sail to the wonderful island of Formentera with its pearl white sandy beaches, azure crystal-clear seas. This transparent seas of Formentera is the result of the absence of plankton. Almost all these beaches have been preserved in their natural state, ideal for swimming with very gentle slope. In 2009 Estrella Damm launched a beer publicity film with Formentera as the star of the whole campaign. You can see the video for yourself below. Last summer people were literally walking off the ferry humming the theme tune. This ad managed tremendously well capturing the spirit that exists amongst a lot of the young people that visit this Island. But there are all sorts of visitors to the island, including many families, older visitors, water sports lovers, hippies and dedicated naturists. S'espalmadora, the nearest to Ibiza Islet of Formentera, has a hidden bay. Very attractive for families and friends to go with their boats and organize pick-nicks, bbq's or paella's. The little Islet of this bay, only about 200 meters wide, has many Gratitude Rocks formations. Once you have visited the place, you will understand why there are that many Gratitude Rocks formations made. One of those magical places on earth to visit in your lifetime. After your busy day you can relax in the garden of this Spanish villa. At the second terrace there is a gas bbq ready to be used. If you want to enjoy peace and quiet a little longer? Just find a little spot on one of the 5 outdoor terraces of this Spanish villa. Admire the stars in the beautiful clear night, with the soothing sounds of the sea breaking against the rocks. 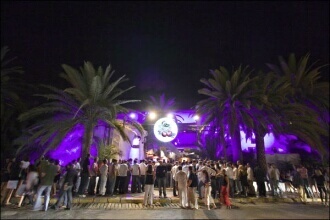 If feel of having a night out, you can dive in the nightlife of Ibiza town. 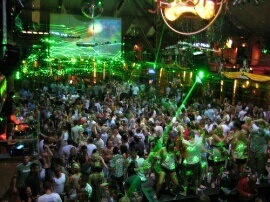 The four biggest discotheques in the world are on the island, you really will not get bored. Does this sound like your dream holiday? But you believe it will be just too expensive.. Although we offer you a luxury Spanish villa, without swimming pool, but with outdoors jacuzzi, we can keep our rental prices very low. Please do compare prices to those from a similar Ibiza villa with swimming pool, you will need to pay approx. 2000 to 3000 euro a week more. 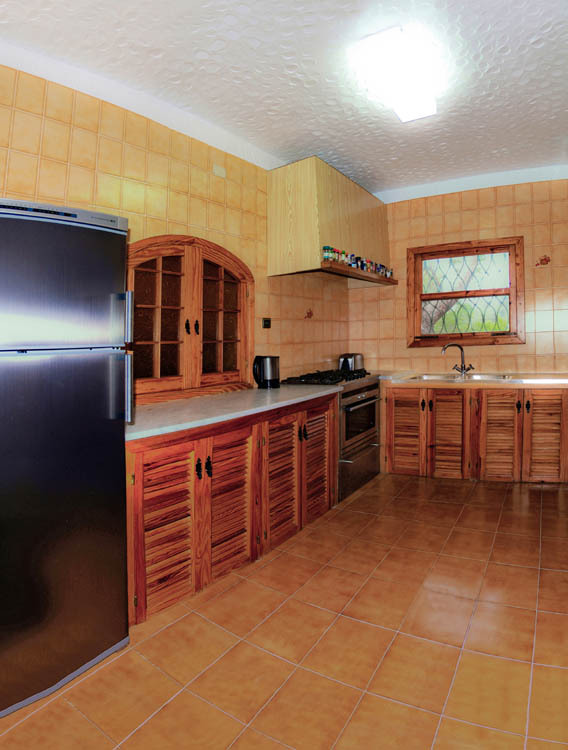 By renting our villa, it will allow you to opt for extra activities, eating out every day or evening entertainment. Do you need to have a swim in a pool? At Cala San Vicente, very nearby to the Spanish villa three swimming pools and a children's paddling pool are always available. There is also a large community swimming pool 4min. from the villa on the same mountain. No other Spanish villa with swimming pool in Ibiza, can offer a sea-view like ours, it is just exceptional. In 2004 a Spanish tv documentary showed the best sea views in Spain, of which the views from our hill were on top. 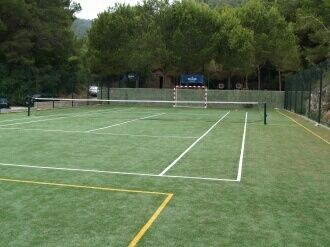 Two tennis courts are very nearby. 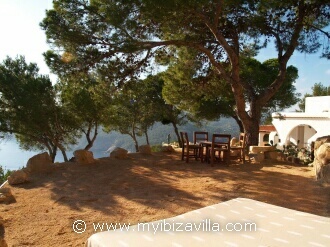 With this Spanish villa in Ibiza your dream holiday will be within reach! Do you prefer to spend your holidays relaxing near the pool? I would then recommend a holiday home at the mainland of Spain. There you will be able to rent a Spanish villa with swimming pool for approx. 2500 Euro. But I am sure you already found out that during such a stay, boredom quickly sets in. You would probably be more tired after your holiday then before. Staying in our Spanish villa (although we are not offering a swimming pool) will enable you to return home, totally relaxed and full of vitality.